The 2010 American Buffalo Gold Proof Coin features a design that many familiar with America coinage will recall from the early 20th century. Both the obverse (heads side) and reverse (tails side) are slightly modified versions of the design work of James Earle Fraser that was first featured on the nickel in 1913. 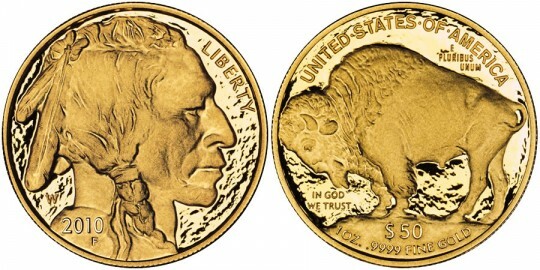 The same design ran on the nickel until 1938 and has come to be known by two different nicknames, the "Indian Head Nickel," or more commonly, the "Buffalo Nickel,"
Quite different from those five-cent pieces, however, these new American Buffalo coins are struck from .9999 fine 24-karat gold. When they first appeared in 2006, they marked the first time the Mint struck such a grade of gold for a coin. The coins themselves were authorized as part of the Presidential $1 Coin Act of 2005. In that act, the design on the coins was required to be based on the Buffalo Nickel for only the first year. After that, the Treasury Secretary could change the imagery, but a change has not yet been made. 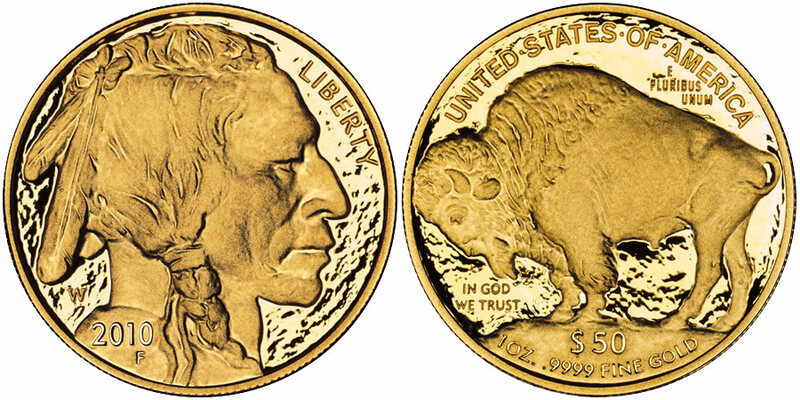 The Proof Buffalo is a favorite among collectors even though the Mint also strikes bullion versions of the coins. In fact, demand for bullion coins in 2009 affected the availability of the proof versions that same year. The Mint was kept quite busy utilizing most of its gold blank resources in striking bullion American Eagles, as it is required to do so by law. This meant it did not have the ability to produce the Proof Buffalos. The situation was remedied by late in the year and the Proof Buffalos premiered on October 29th to exceptional sales. A profile of a Native American designed by James Earle Fraser is seen on the obverse of the Buffalo Gold coin. The inscription "Liberty" is seen in front of the face, with the year shown around the shoulder area. Behind the neck is the "W" mintmark for West Point. Also designed by James Earle Fraser, the reverse features an American Buffalo (also known as a bison). Over the buffalo are the inscriptions "United States of America" and "E Pluribus Unum." Underneath the creature is "In God We Trust," "$50" and "1 Oz. .9999 Fine Gold."